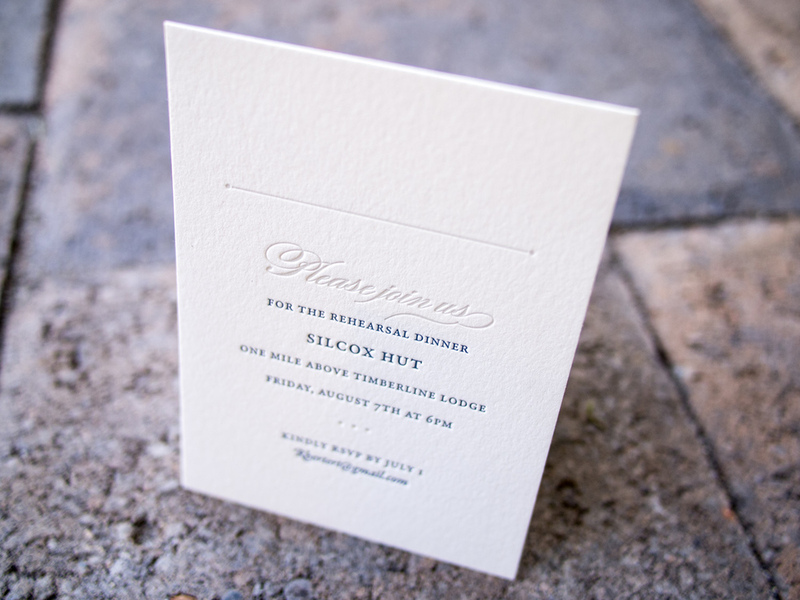 It can be tricky to create a wedding invitation suite that's colorful, playful, and exciting, while still conveying the sophistication of the event itself. While working with Terisa and Tom, the goal of maintaining that balance was always at the front of our minds. Ok, sure, the save the dates leaned a bit toward the whimsical end. 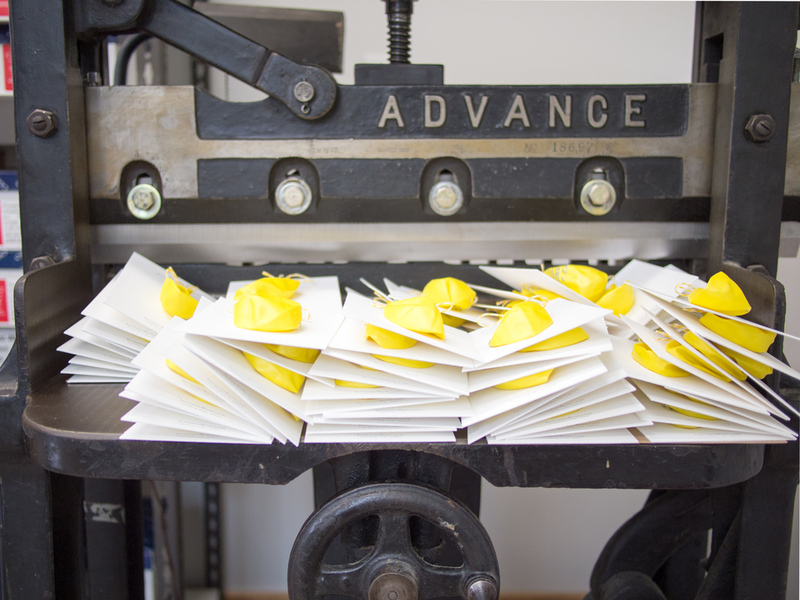 We printed and hole punched a thick 600g note card, and then tied custom-printed balloons for the guests to inflate. Details of the event were on the balloon (and on the website for the faint of breath). For the invitations we kept the yellow and gray color scheme and the Bombshell / Neutra / Trend Slab typeface combo, but left out the balloons (time to get serious). 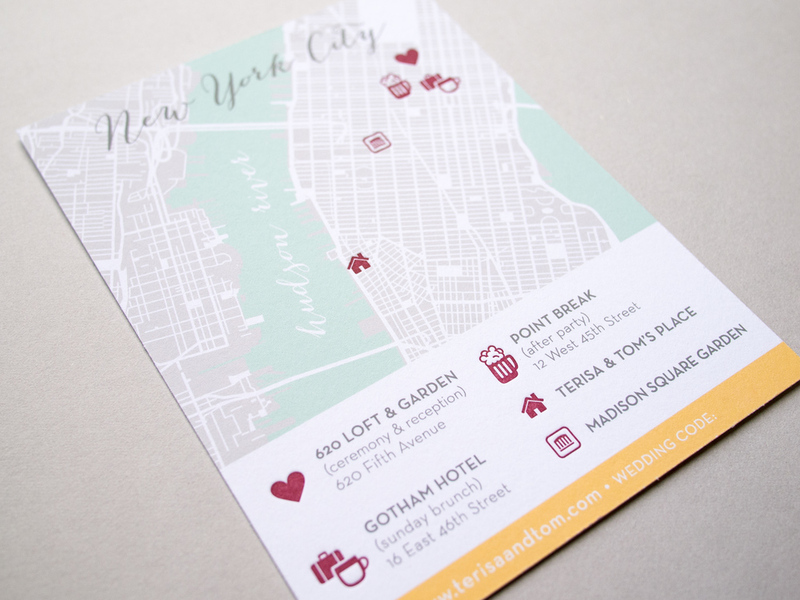 We carried a similar look through to the reply card, a custom designed map, and a rehearsal dinner invitation with its own color scheme and tear-off reply card. 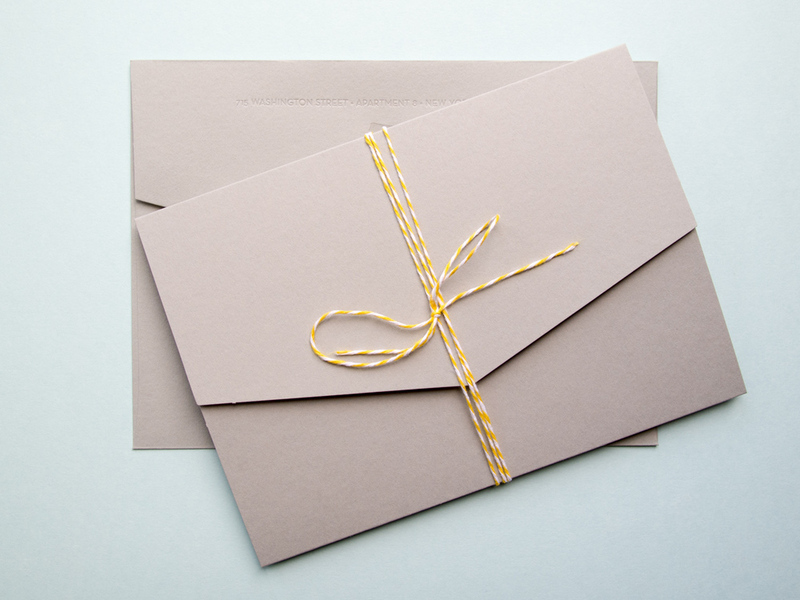 The set was then placed inside a gray tri-fold pouch, tied with twine, and sealed in a matching gray envelope. 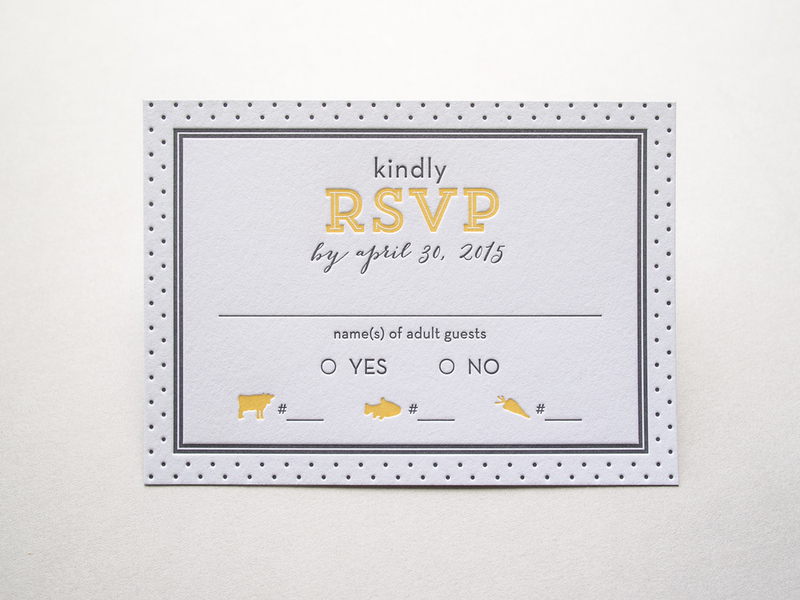 Posted in wedding invitations and tagged with balloon, fluorescent white, 600g, 300g, yellow, gray, pocket fold, twine, rehearsal dinner, tear-off, hole punch, perforation, inkjet, map, save the date. November 24, 2015 by Travis Friedrich. 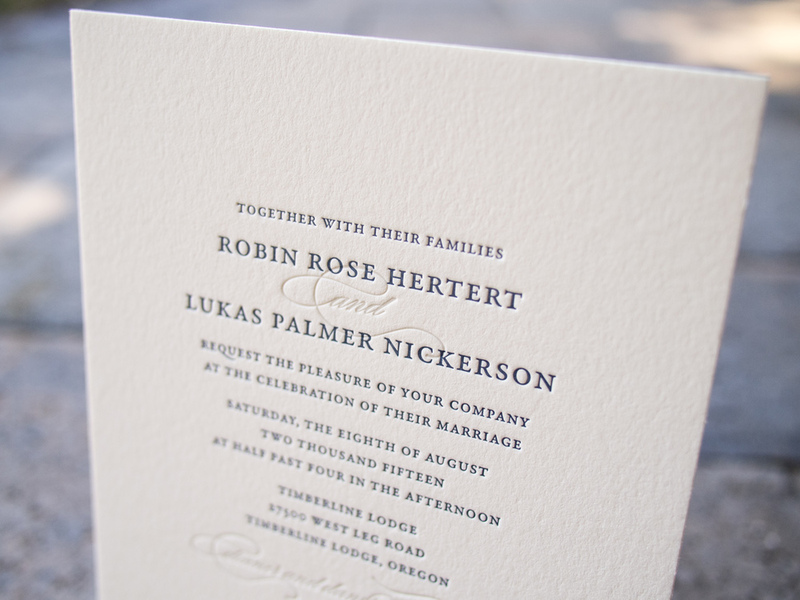 Perhaps you saw our 2013 blog post detailing the underused letterpress technique of halftone screens. In short, we can use tiny dots and on-paper ink mixing to create the illusion of gradations and multiple ink colors. 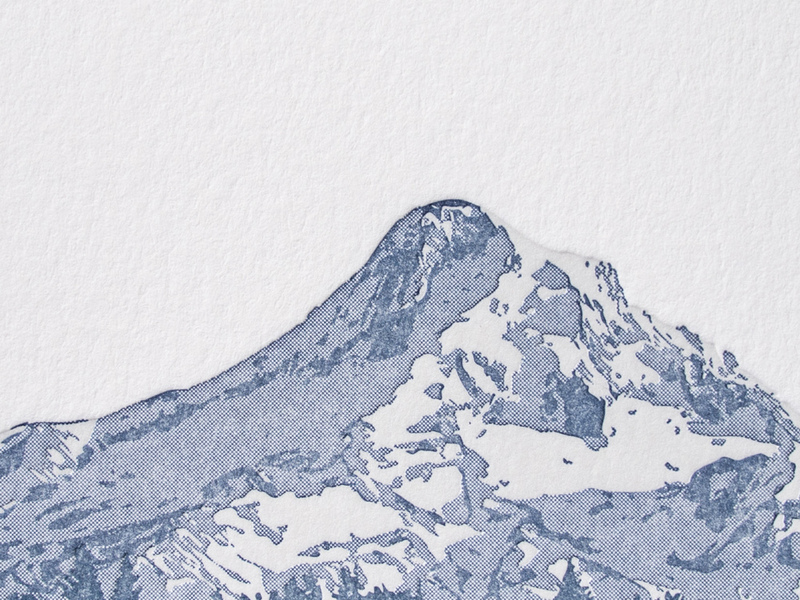 For Robyn and Luke's Timberline Lodge wedding, we used just two inks (a very light gray and a dark blueish-gray) to create a photo-realistic image of Oregon's Mount Hood. To accompany the invitation, we printed an info card with a tear-off reply postcard (this one with a halftone bird because, hey, put a bird on it), a small rehearsal dinner invite, and a custom woodgrain-lined envelope. Posted in wedding invitations and tagged with ecru, 600g, halftone screen, tear-off, reply postcard, envelope liner, cool gray, bird, rehearsal dinner. August 11, 2015 by Travis Friedrich.